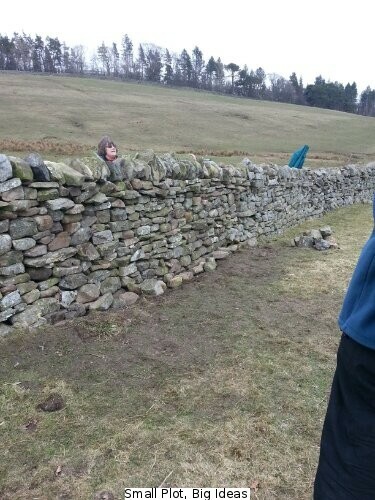 A couple of weeks ago I spotted on the North Pennines AONB Twitter account (@NorthPennAONB ) that there was a Walling Taster Day on Sat 13 April. It seemed like a good idea for a day out and an interesting change from the usual routine so I booked up a couple of places. 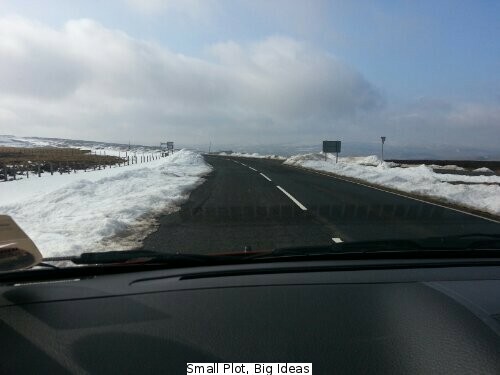 The journey over was fascinating as (I think) we crossed from Tynedale to Weardale then to Teesdale which was the final destination. I’m not completely sure though as we did end up on a slightly unplanned route. Going over the tops between each valley quite clearly illustrated the differences between the higher ground which still had some relatively large snow banks left by the ploughs and the greener, almost spring-like valleys. The whole event was very well organised and was run by Peter, a reassuringly competent and knowledgable instructor who really knew his stuff. The fact that there was a small group of only 6 people meant that everyone was able to get some one to one guidance from time to time. It was quite daunting at the start when we took down the section of wall we would be working on but once that part was done it was much easier to understand the principles behind the construction of these walls. I won’t go into all the details about wall constructions and the terminology for each part, if you’re interested they are running more walling taster days. I would definitely recommend them to anyone with a slight interest in them and certainly if, as we will shortly, you own some walls that may need repairs from time to time. We feel confident enough after that one day to think about mending a few small broken sections of our own, at least if that falls down we can just have another go! 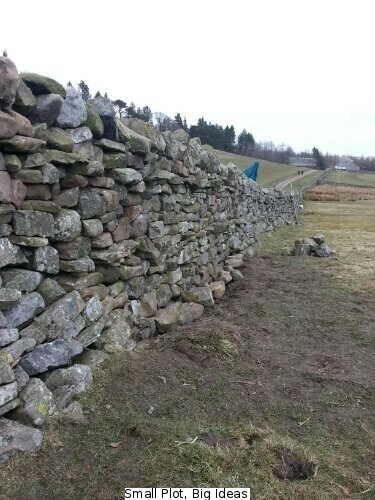 By lunchtime the first half of the wall was in place and looking good to out untrained eyes at least. This picture doesn’t really do it justice though due to the angle when taking the photo. It looks quite a short section of wall here but when measured the section we actually worked on was around 4 metres long! I wasn’t sure that we would finish by the stated time of 4pm, especially when a small extra section fell down of its own accord not long after we had started. Luckily no more collapsed and we were able to safely build up the wall to fit in very nicely with each side of the gap we made. I’m sure that a skilled Waller would probably have had a fit when they saw our results but to me at least it looked convincing enough. 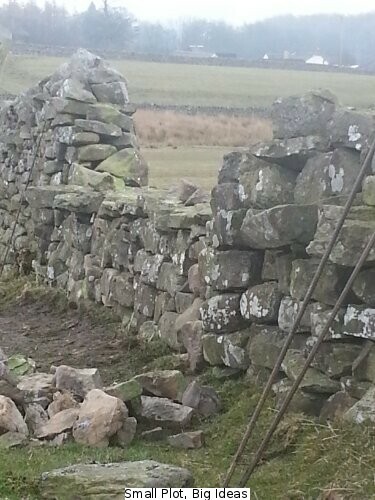 It was clear of the trampled ground which section we had worked on but when I looked up and down the rest of the wall it seemed to fit in beautifully, in fact some sections were much worse than our amateurish attempt.